On June 4, the Okinawa Defense Bureau (ODB) began notification procedures as set forth in the Okinawa Prefecture Red Soil Prevention Ordinance, which is necessary to perform before depositing soil in the ocean. These soil deposits are part of construction in Henoko, Nago City, of a replacement facility for Futenma Air Station. 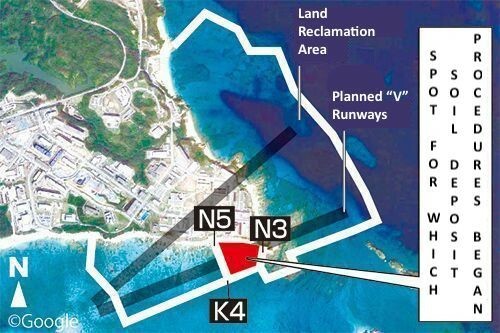 On May 29, the ODB submitted official documents to the Okinawa Prefectural Government (OPG) setting out its methods for carrying out land reclamation plans and red soil outflow countermeasures, among other things. When the OPG finishes its formal examination of the ODB’s methods, the ODB will report its countermeasures to soil run-off and related things to the OPG. Following this, once the OPG finishes its content review, the ODB can begin depositing soil in the ocean. The movement towards depositing soil is gearing up. If preparations go forward at a typical speed, the formalities will be finished at the soonest by mid-June, and at the latest by late July. There is no other required procedure from within Okinawa for land reclamation soil depositing. If the seawalls surrounding the land reclamation area are completed, the stage will be set for soil to be deposited. The OPG does not have the power to grant authorization based on Prefecture Red Soil Prevention Ordinance. On top of examining and reviewing notifications from the business operators interacting with the Ordinance, when necessary, the OPG can order negotiations of the contents and alterations to the plans. This Ordinance requires notification 45 days prior to the commencement of any operations. However, operations can commence even within 45 days of the OPG finishing its review. This generally takes the OPG one to two weeks to complete. The countermeasures to red soil outflow that the ODB submitted at this time applies to the ocean section enclosed by the K4, N3, and N5 seawalls on the south side of Cape Henoko. In order for the ODB to prevent red soil outflow, the countermeasures establish that when muddy water is emitted in the land reclamation area where sand will be deposited, the mass of floating particles must remain below 25 milligrams per one liter of water, even lower than the Prefecture Ordinance standard of 200 milligrams per one liter of water. On May 28 the Environmental Oversight Committee reviewed these terms, and the members consented to them. The next day, the ODB submitted its documents to the OPG.